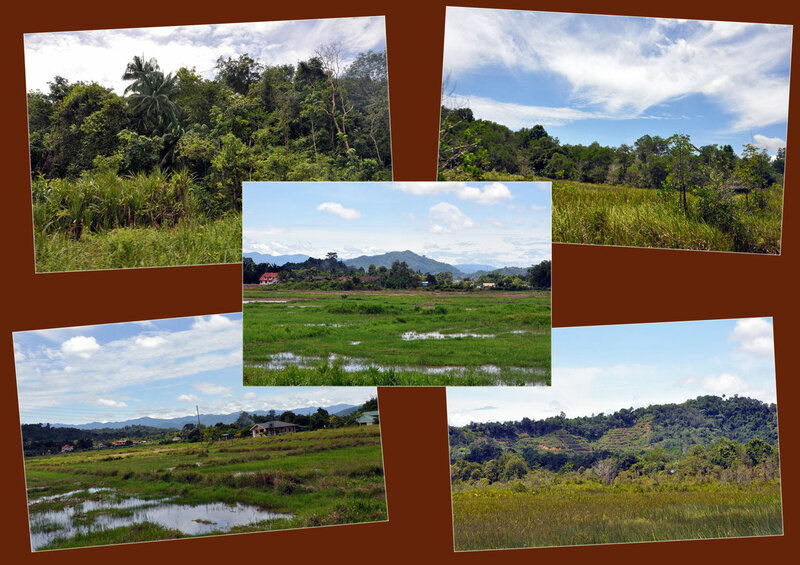 We are so lucky to live in SE Asia as travel is quick and at a fairly low cost ..... this allows us to travel more often. 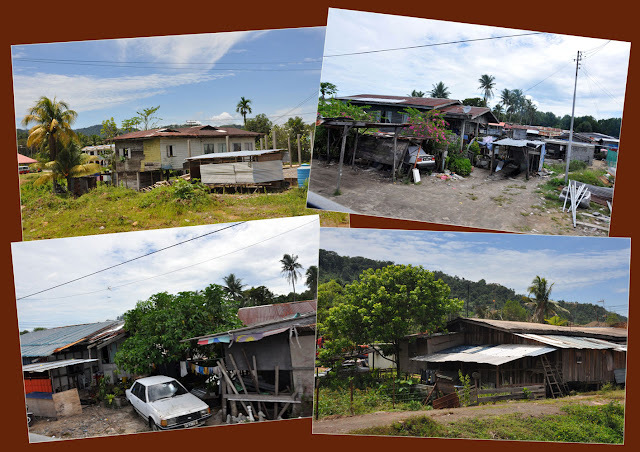 One of our recent trips was to Kota Kinabalu in Borneo. 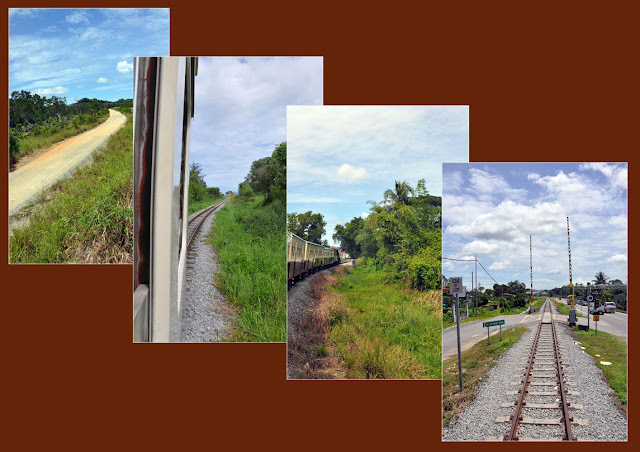 While we were there we did a day trip on the North Borneo Railway to Papar and back, not just any train trip either ... this was a steam train trip! The North Borneo Railway Steam train started up again in July of this year and I hope it continues to run for many years yet. Traveling on a steam train will be a very new experience for many people and would be quite exciting for children if you were visiting the region as a family. After we left the Tanjung Aru Station and chugged past the market towns of Kinarut and Papar, on the outskirts of Kota Kinabalu. The train meandered past beautiful natural areas such as the backyards of small settlements, villages, Chinese temples and churches, mangrove swamps, a tunnel, as well as padi fields and oil plantations. 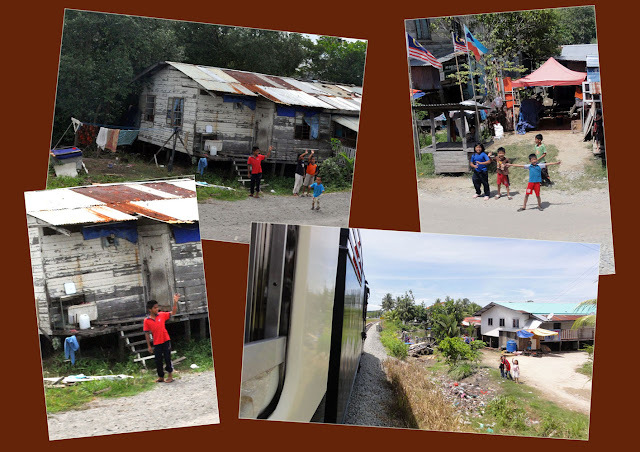 After we enjoyed our light breakfast on board, we took the opportunity to take more photos of the countryside, the homes and all the children that came running out to wave to the train! As the train pulls out of the Putatan station, the development of Kota Kinabalu begins to slip away. Time and history begin to take over. 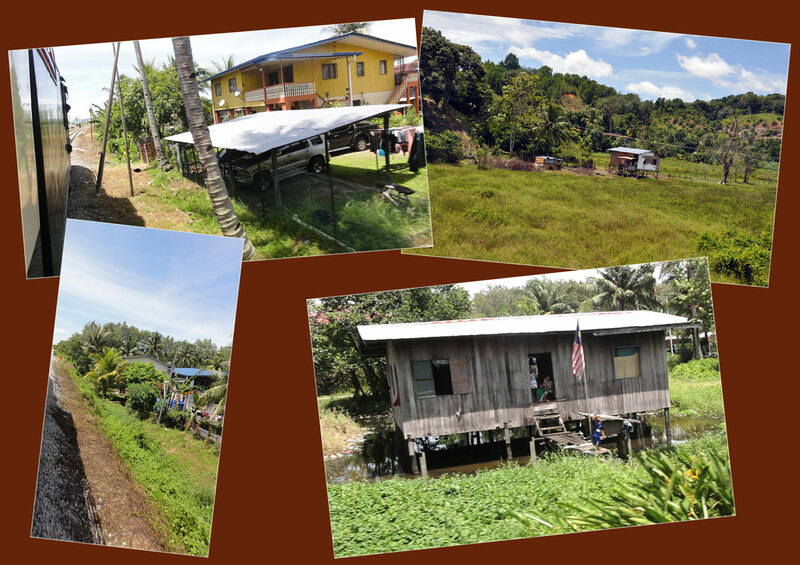 After Putatan, the train veers into the countryside, away from the modern day trapping of Sabah society. The train hugs the coast of Lokawi Bay and offer passengers an opportunity to take in the picturesque view of the South China Sea. The train stops at Papar, known as the rice bowl of Sabah for 20 to 30 minutes and allows passengers to disembark and walk around the small town's tamu (market) which sells all sorts of jungle and farm produce. The original route when established by the British ran from Tanjung Aru to Beaufort and the line passed through Kinarut and Papar. The train was also used carrying daily necessities and other products such as rubber sheets, timber, coffee and jungle products to be traded locally or exported to England and elsewhere. After the British packed up and left Malaysia the fate of the railway suffered and the steam engines were left to rot at the railway yard. It was during this time that Sutera Harbour Resort and Spa came up with the idea to revive the train service in order to preserve part of the State's heritage. The steam engine was back on track after three years. 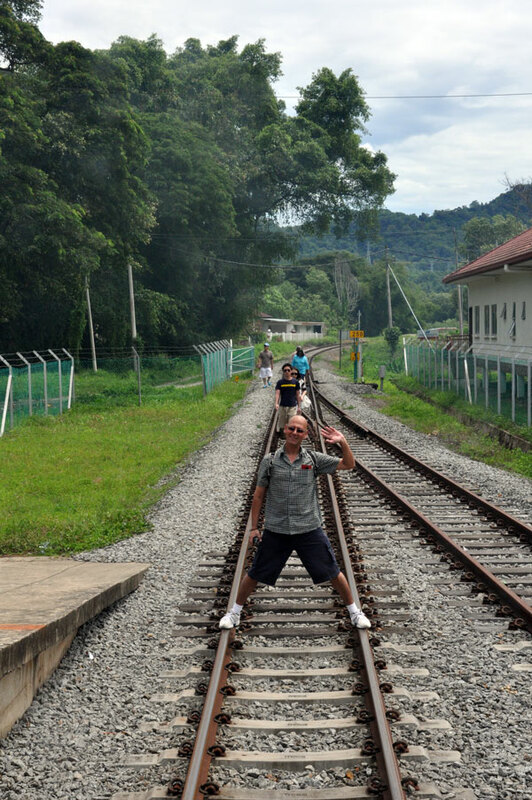 The train now belongs to the Sabah Railway Department and the resort has the license to sell tours on the train. We would highly recommend a visit to Kota Kinabalu, it may not have the best white sandy beaches, or the finest resorts and spas, but it certainly has character and charm. 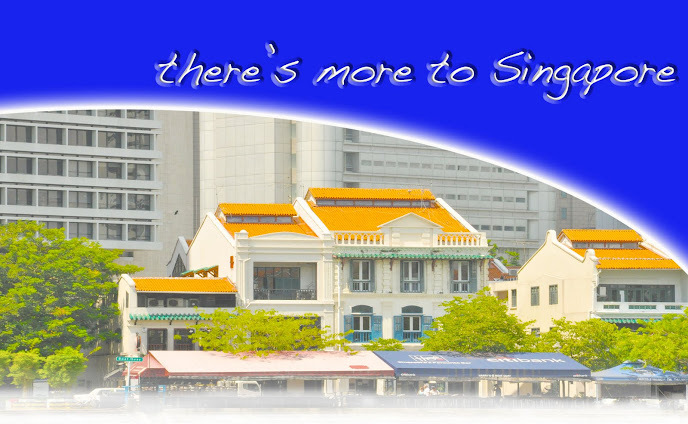 There are a couple of resorts in Kota Kinabalu and another on the near by islands. But if you travel to Kota Kinabalu, do get out and experience the true Borneo, visit the markets, walk to the jetty to see the fishing fleet and yes, take a nostalgic ride on the steam train if you can! 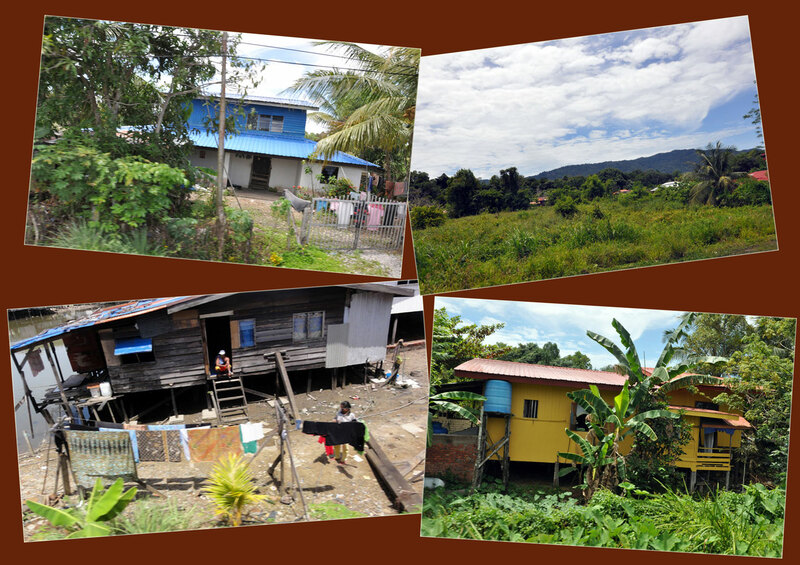 For information on our recent visit to Kota Kinabalu, do read the blog posts listed below. 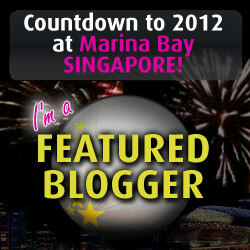 There has been much to document about the journey and am happy if you have got this far!! But please stay with us as we travel Papar and 'experience' the railway turntable. A railway turntable is a large circular platform which is used to turn locomotives and other rolling stock for railways. A well-engineered turntable is designed in such a way that the efforts of only two or three people are needed to operate the turntable, even when dealing with very large and heavy locomotives. A related railroad term is “wye,” a term used to describe a special configuration of track which essentially allows trains to make really big three point turns so that they can turn to face the direction they came from. stay tuned for further blog posts on the train journey we experienced in Borneo!